Dovico is a timesheet, time tracking and project time management solution designed for use by mid-sized businesses to large enterprises. The largely integrable software enables you to keep track of employees and project progress in real-time. Expenses and timesheets can be tracked against a project to ensure that you always recover all your costs. Data is displayed clearly in Gantt charts. Track and manage billable and non-billable time and expenses whilst managing projects, clients and working hours. Approval workflows can ensure the accurate entry of time and expenses before the data can be submitted. Productivity becomes measurable with Dovico´s project analysis tools, designed to help maximize efficiency. Software by Dovico Software Inc.
Great program with some suggested updates. so far so good.Easy to use and internet based is great for employees out the office. Easy to use and internet based is great for employees out the office. Thank you for your time in writing a very helpful review! I am glad our software is easy for you to get the job done. Mobility in the engineering field is crucial so I am glad we fit the bill. Also, a huge thank you for providing such a detailed list of suggestions. I have posted them on our design team Slack channel so that they can take them into consideration upon future releases. Something even as small as a different order to a list of projects can make a huge difference. Before we started using Dovico in 2008, each employee was using a company spread sheet to manually keep track of time and printing them off to hand in every month. Besides the pros listed above, the huge time savings during billing and payroll more than offset the price. 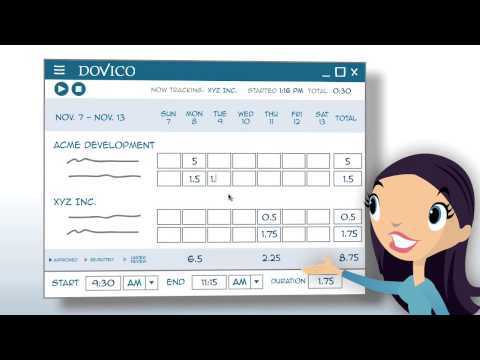 Dovico was the first time tracking software we tried and the only thing we have used. We have shopped around several times since we started using Dovico and haven't found anything that even comes close!Without a doubt the best thing about this software is the reports. At times we have 50 active billable clients and Dovico gives us the reports we need to make sure they all get billed properly. We did the locally hosted platform for 5 or 6 years before switching over to the Dovico hosted version. Having Dovico host the software has made it possible for employees to log their hours when working in the field which is a huge plus! Without a doubt the best thing about this software is the reports. At times we have 50 active billable clients and Dovico gives us the reports we need to make sure they all get billed properly. We did the locally hosted platform for 5 or 6 years before switching over to the Dovico hosted version. Having Dovico host the software has made it possible for employees to log their hours when working in the field which is a huge plus! The only complaint we have had, and complaint is a stronger work than necessary, is the price increases. We have shopped around and found cheaper services but we haven't found anything that even come close to Dovico's reports. We are spoiled and we gladly pay our annual subscription! Thank you for taking your time to give us an amazing review! I am so glad that we have made your billing process so much easier and accurate. Please understand that we take much care in increasing our prices. The last time we increased our prices was in 2012, so we try not to make it a habit. I hope we continue to give you value and please, let us know if we can give you more. The corporate time is captured properly and one is able to make an analysis as to who spends what and where. The expenses are easy to track and one can question the authenticity of the expense as the description is required. This software is truly a one-stop-shop for capturing time and expenses.Dovico captures all that relates to a consulting engineering company in respect of time and expenses. The fact that supporting documents can be uploaded to support a claim made borders on the horizon between ordinary timesheet software and real and practical timesheet tools. The pie charts give the supervisor that added advantage of looking and evaluating where most time is spent and a drill down can be done with ease. Dovico captures all that relates to a consulting engineering company in respect of time and expenses. The fact that supporting documents can be uploaded to support a claim made borders on the horizon between ordinary timesheet software and real and practical timesheet tools. The pie charts give the supervisor that added advantage of looking and evaluating where most time is spent and a drill down can be done with ease. At times it is a bit difficult to get support online but as soon as you send an email to the support team, the help comes trough. I am not so sure what can be done to make it easy to get help online. Thank you for giving us a great review! I am happy to hear that our reporting gives you the information you need to get your work done! We do our best to give support around the clock with our online chat, but growing as much as we are, we sometimes need our beauty sleep. While I'm glad you still get service, I understand the frustration of not getting the service you need from the online chat. I will report this to our support department. The timesheet allows the employee to post their hours to each specific project and it allows supervisors to monitor the project hours and make sure each employee is recording their hours properly and correct them if entered incorrectly. Overall, we don't have any software issues where something would be carried over incorrectly into Quickbooks. The Dovico Link works very well to transmit hours into Quickbooks.Very use friendly. Easy to teach new employee's how to use. Layout of timesheet is very self-explanatory. Like the fact that you can log in from anywhere's and enter your time or do any maintenance work. Also like the mobile app. Very use friendly. Easy to teach new employee's how to use. Layout of timesheet is very self-explanatory. Like the fact that you can log in from anywhere's and enter your time or do any maintenance work. Also like the mobile app. Restricted as far as using the program with Quickbooks payroll portion. Rather than setting up the software as it is meant to be used (meaning to use for tracking the actual job task) we have to use the "Tasks" to correspond with the employee's title in order for payroll to submit correctly. Thank you for your awesomely detailed review! Your feedback is certainly appreciated. I'm glad that you find the mobility side of our timesheet solution valuable. Continually improving our Quickbooks integration has always been on our plate. In fact, just yesterday around the lunchroom, we were discussing what needs to be changed and upgraded in terms of our Quickbooks integration. I'll forward your concerns to the team so that they are aware of them. Dovico is solving our needs for reporting and invoicing our services to our customers. At this point we are using two solutions to manage our support engineers time. One of them is Dovico, where they register the time they spent for our customers and another is MS Sharepoint where we create a schedule for them to know where they have to be in the next days. We would love to use the same application for both needs but unfortunately Dovico is not providing the right solution for that. My colleague that is in charge with scheduling our resources discussed with somebody from your support and they couldn't find a solution. Thank you for taking your time away from what you do best to leave us a review. I am glad that we are meeting your timekeeping and invoicing needs. Unfortunately, we do not have a scheduling component to our software as you are aware. I will forward your request to our design team for future consideration. With more demand, means more desire to help fill it. Below are some frequently asked questions for Dovico. Q. What type of pricing plans does Dovico offer? Q. Who are the typical users of Dovico? Q. What languages does Dovico support? Q. Does Dovico support mobile devices? Q. Does Dovico offer an API? Yes, Dovico has an API available for use. Q. What other apps does Dovico integrate with? Q. What level of support does Dovico offer? Q. Which apps is Dovico compared to most often?